Are your students learning about Jacksonville? Maybe even taking a field trip to the city? Grab this activity page to enhance their adventure. 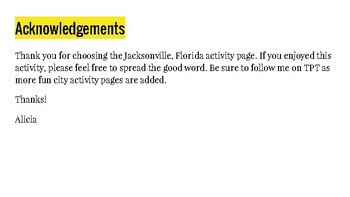 This activity page provides a fun and entertaining opportunity to learn about the various aspects of the city of Jacksonville. Students can practice their art skills by completing a self portrait, dig deeper into the history of Jacksonville with a word code puzzle. Students can even try their hand at geography and mapping by finding what well known sites are found at various coordinates. 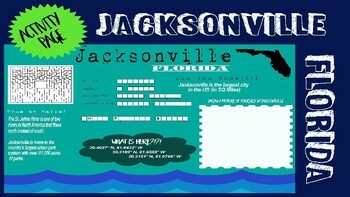 This activity is sure to provide an extra something to learning about Jacksonville. Answers are included. Activity page can be printed and laminated for long term re-use.